A few friends and I checked out the fly fishing show on Friday and then headed up to Steamboat to fish the Yampa River tailwater below Stagecoach Reservoir. If you haven’t fished this tailwater, put it on your list because these fish love to eat 365 days a year and the catch rate is out of this world compared to other CO tailwaters. 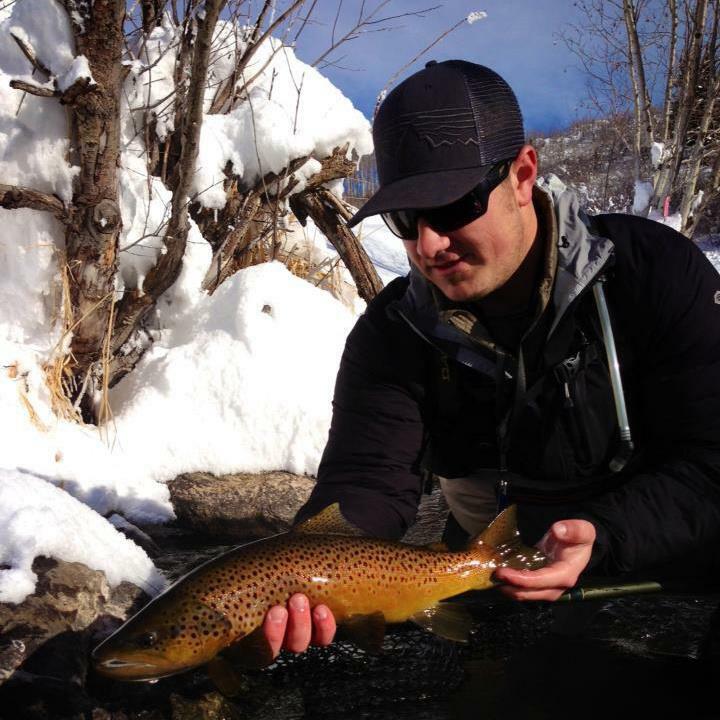 Winter is my favorite time to fish the Yampa River because there is almost never anyone there and the fishing is always great! Why is there no one there if the fishing is great? What’s the Catch??? In the winter, the road that takes you to the river at Stagecoach State Park is closed to vehicles for wintering elk migrations. This means a 1.5 mile walk, or bike ride alongside the reservoir to reach the river. Often times the snow is pretty well packed from dam service vehicles, but if there is new snow you might want to find some snow shoes or cross country skis. Dress light going in but have layers with you. What you don’t want to do is build up a too big of a sweat walking in and then stand still fishing for 4 hours once you get to the river. The other option if you have a snowmobile is to take CO 131 to Country Rd 18 and use the snowmobile to get in from the Service Creek area. Winter fishing means shorter days. That being said, I have always found that trout who call the Yampa Tailwater home like to eat 24/7 no matter how cold it is. Look at the weather and decide when you can tolerate being out there and for how long. I There is a good chance you will not see another person so I wouldn’t recommend going in alone, but if you do, please make sure to tell someone where you are going and when you will be returning. If you are prepared with the correct clothing & gear I firmly believe you can fish comfortably in any weather or temps. Nymphing: Typical winter nymphing applies. Sight fish when you can, but there are so many fish in this section that if you are getting good drifts through likely water (slow tailouts, runs and deep pools) you will catch plenty of fish blind fishing. 7.5″ 4x leaders for nymphing, yarn or pinch on strike indicator, #4-#1 split shot, 4x-6x flourocarbon tippet. Lead attractor flie that you will want to have are a #18 pink or Red Flashtail San Juan, #16-18 Orange or Olive Hunchback Scud or 6mm troutbeads in mottled glow roe or mottled snow roe. Dropper flies should include midges and small baetis patterns. My favorites for the Yampa have been #22 jujubees, Top Secret Midges, Disco Midges, purple jujubaetis and RS2’s. This trip I tried some new umpqua patterns that the fish really responded to. All the new Landon Meyer flies produce as does the new black flashwing RS2. Winter Dries: Even when temps don’t even come close to being above freezing, I have always found pods of rising fish in the winter on this tailwater. The reason being is that there aren’t people there to put the fish down once they start rising. When I fish dries I will use 22-24 parachute adams, Sproute Midges or Morgan’s para Midge. I only use Frog’s Fanny on small dries, I fish a long monofilament leader (9′ to 11′ 6x) and I usually present the fly down and across to rising fish. Look for fish to be rising on the slow slack water. Streamers: Streamers are certainly an option in some of the deeper pools. Black, Olive and Natural Slumbusters are the ticket in size 8. Short quick strips followed by a pause has always been a good rhythm. I will generally use a sink tip or if I don’t feel like swapping leaders, tie on a a long piece of 1x to the end of the leader I have on at the moment. The deep water right against the dam has always been good streamer water for me, and especially in the winter. The key to winter fishing is staying comfortable. I’ve always believed there is not such thing as bad weather just bad clothing. For that reason, I will elaborate more on what I have found over the years to help keep me on the water longer and help you eliminate some gear hassles. Wading Boots: If you are still using felt sole boots in the winter, stop torturing yourself! The new rubber soled boots don’t accumulate ice & snow like felt. Gloves: Simms Windstopper Gloves: I have been using the full fingered Windstoper gloves and have found these to be the only gloves I can fish with that still allow for some feeling. They are super warm but also thin enough that you can retie without taking the gloves off. Eyewear: Whatever you are wearing, make sure you have some type of lens cleaning cloth readily available for when the sweat from your face fogs up your glasses. Polarized is the obvious but I can tell you that my next glasses will be the Smith Polychromatic light adjusting sunglasses. In those shaded areas, I consistently find that a standard bronze or copper is too dark and the glare from the snow in sunny areas kills my eyes. The smith polychromatic lenses get lighter in the shade and darker in the sun. Hydration: The Fishpond Vest/Packs are perfect for a trip like this. Gear storage and the option for the camel back. One thing I should point out is that you need to keep the tube from the bladder up against your body. If you leave it exposed, water inside it will freeze. Winter Yampa River Fly Rods: Soft Medium Action 4-5 wt rod. Don’t take your fast action broomstick unless you enjoy retying after a break off when you can’t feel your fingers. Medium action rods are best for light tippet and short casts on winter tailwaters. My tried and true has been the 8’8″ Scott G2. This trip we tried the Sage Circa in the 4 and 5wt. Like the G2, the Circa is great just at short range/hand-to-hand combat light tippet fishing but probably more accurate than the G2. The other thing I noticed is that this rod get less ice in the guides than any other rod I’ve used. I think the smaller guides don’t allow for as much water to drip and freeze as other rods. Who knows, it is still worth putting some Stanley’s Ice off in the guides before you head out. Reels: If you are already on the Lamson program, you’re fine because they have a sealed drag. If it is any other reel, don’t let the reel get wet! I had one rod with a Ross Evo LT on it, and in trying to pull line out once it froze I destroyed the gears and broke my fly line in one tug! Fly Line Caution: The above brings me to my next point. When fishing in near zero degree temps, all fly line gets brittle. On more than a few occasions I’ve had fly line wrap around a branch, given it a tug and the line breaks in the winter. I also like to use heavier line in the winter if I know I will be doing a lot of nymphing. If it is a 4wt rod, I will put a 6wt line on it. The heavier front end will help load the rod a lot easier when there is only 3 feet of line out of the tip. I also find that the heavier line helps pull through ice on the guide. My favorite line in the winter is the Rio Nymph Line. Forceps & Hook Removing Tools: One thing I always triple check in the winter is that my barbs are smashed! The less you have to handle the fish, the warmer your hands stay. If you are wearing mittens, get the ones that you can still squeeze with your mittens on. The other little tool I make sure to have with me is the Catch’m Release Tool. Simply slide the end down the line and knock the hook out without ever touching the fish or having to take your gloves off.